1. You don't need to diet to lose weight. Diets are only good for short term weight loss. Yes you lose weight when you are on them but as soon as you stop, the weight piles back on and sometimes more than what you weighed before you started the diet. The best thing to do is eat a balanced amount of food, no need to cut anything out. I never used to eat breakfast, I could never face eating that early in the morning but I've since found out that breakfast really is the most important meal of the day. It helps kick start your metabolism and gets you burning calories from the get go. You don't need to eat a huge meal, smoothies are great for people on the go. One of my favourite breakfast is my banana and oat pancakes. 3. Switch white for brown. Carbohydrates are actually good for you as long as you eat the right ones. I always found myself bloated after eating a bowl of pasta or one of my favourite sandwiches. Since switching to wholemeal pasta, brown rice and wholemeal bread, I no longer have that problem. It also means you are getting a lot my fibre in your diet which in turn will make you feel fuller for longer. I've found protein to be an essential part of my diet. Protein helps in two ways. Like fibre, they help you to feel fuller for longer and are actually harder to digest so your body burns more calories whilst processing them. Protein is also known to help build lean muscle, this makes you stronger and more toned but muscle also helps burn calories when you are not active. Protein can be found in things like chicken, fish and beans. I always have a protein shake after I exercise to help get that extra protein to the muscles that I have just worked out. I put my hands up, I am really naughty when it comes to drinking enough fluids in a day, I used to go all day without drinking. Now I try to make sure that I have atleast a glass of water with every meal/snack. 6. If you're feeling hungry drink some water first. Sometimes when you think you are hungry, you might actually be thirsty, so always drink a glass of water before consuming any unnecessary calories. 7. Green tea is your friend. Did you know that green tea can benefit your body in many different ways including lowering blood pressure and reducing the risk of a stroke. Another great benefit is that it increases your metabolism which in turn helps you burn more calories. I drink a cup each morning with my breakfast and it is fab to have chilled on those hot Summer days. 8. You need to exercise. Sorry but it is true, to stay fit and healthy you need to add a bit of exercise in too. Some of you may be thinking how can you fit it into your daily routine? Well if I can manage it with 4 kids I'm sure you can manage as well. It can be as simple as walking instead of getting in the car. At home I love the 10 minute solution DVDs as I can fit them in when I have quiet moment, although the kids do like to join in too. It is a good idea to get in a mix of cardio and weight lifting and switching up the speed in which you workout helps too but don't over do it, injurying yourself is no fun. I know I've had times where I've stepped on the scales and either there is little or no change or even worse, I've put weight on. This in turn has left me disheartened and feeling like why do I bother. Nowadays I tend to ignore the scales and take my measurements instead because a lot of times when you haven't lost pounds you have infact lost inches. 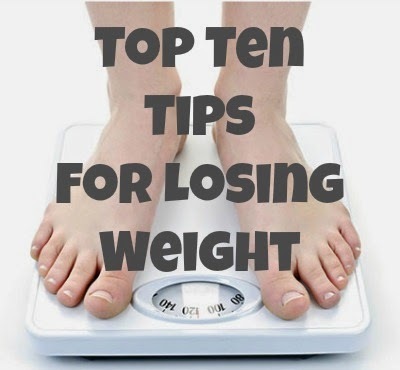 As I said at the beginning, I am no expert but I really hope these tips help you on your weight loss journey. Just remember slow and steady wins the race, the slower you are losing the weight, the more likely you are to maintain that loss. These are such great tips. It's the simple tips that work, but sometimes it feels like so much effort to actually implement them! I'm terrible for skipping breakfast! Must try harder!! Great tips (except I can never drink green tea or any kind of tea!). Eating breakfast is my killer, the more I eat at it, the more I seem to eat during the day which is never great, even though it's better to eat it than not. My issue is motivation, even though I know I need to get back to exercise etc. Am back swimming once a week, but should try and up it to twice. And I'm also a 10 min dvd fan...I have to start going to bed earlier so I can actually wake up at 6 to do the exercise. It's not easy with a 3yo trying to 'help' me and moaning he wants to watch tv.